“It’s like tiramisu and crème brûlée had a baby,” exclaimed my friend with a huge grin after tasting my black bottom FrappaChata crème brûlée. She then immediately dug her spoon in for another bite! You may not have heard of FrappaChata yet, as it’s a pretty new product. If you haven’t, I’m excited to be the one to tell you about it! FrappaChata is the first and only alcoholic iced coffee on the market, already blended and ready to drink. If you love coffee and you love RumChata, you need this in your life. You can drink FrappaChata on the rocks, straight from the bottle (I certainly do!). However, FrappaChata lends itself to so many wonderful baking applications. I had to go all gold for FrappaChata! This FrappaChata crème brûlée is the first dessert that I’ve made with FrappaChata and, judging by how successful it was, I plan to make a lot more. RumChata has lots of recipe ideas on RumChata’s Facebook Page and RumChata’s YouTube channels! 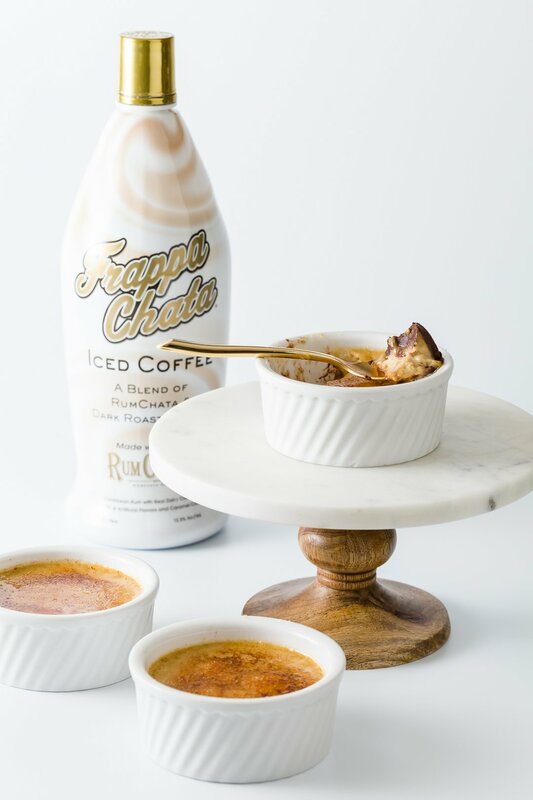 In this crème brûlée, some of the cream from a traditional crème brûlée is replaced with FrappaChata, giving it a wonderful coffee and RumChata flavor. Let’s talk about the black (fudgy) bottom. I got the idea to add a black bottom to the crème brûlée from the new baking cookbook, Fearless Baker by Erin McDowell. Erin is going to be doing a guest post on Cupcake Project coming up soon and I can’t wait for you to meet her and see her recipe! Every spoonful of this FrappaChata crème brûlée ends with a little bit of chocolate ganache. Why don’t we see more crème brûlées like this? The chocolate is such a happy surprise! Crème Brûlée made using FrappaChata with a fudgy ganache bottom! 4 cups water boiling; this amount will vary depending on the size of your baking dish. If you have a tea kettle, it's easy to just heat up a whole kettle and pour in as much as you need. Divide evenly between four 1 cup ramekins. In a medium-sized mixing bowl, beat egg yolks and sugar until thick and creamy. Heat cream in the saucepan you already used until it is almost boiling. Add hot cream a little bit at a time into yolk mixture, stirring the whole time. If you add it too quickly, you run the risk of cooking the eggs. Divide mixture evenly between the four ramekins with the chocolate on their bottoms. Place ramekins in a baking dish and fill dish with boiling water until the water comes 2/3 of the way up the ramekins. Bake for 40 minutes or until the edges of the crème brûlée are set and the middle is slightly jiggly. Bring to room temperature and serve immediately. Or, refrigerate and remove from the refrigerator a few hours before serving. If you serve straight from the fridge, the chocolate will be too hard. Sprinkle a thin layer of sugar over each ramekin and use a culinary torch to caramelize.